Taming the wild mind is a difficult task and it’s one of the primary reasons why meditation focuses so consistently on the breath. Just as our organs constantly work and our glands regularly secrete hormones without conscious thought, so does our mind work unconsciously. It’s estimated that over 80% of all our thoughts lie in the unconscious. Without our unconscious bodily processes operating 24/7 for us, we would be dead. Because we don’t need to think about their operation, we usually take them for granted. What would happen if we needed to be conscious of these processes? If we needed to consciously make our heart pump every minute of every day or be conscious of our stomach digesting food every time we eat? Given that meditating on the breath is such a difficult task, being aware of all those processes, even just during our waking hours, would be impossible. Surely, we’d die. Therein lies the beauty of meditating on the breath. It brings the most basic of unconscious bodily processes into our consciousness. Focusing on the breath is focusing on the unconscious in all its rawness, bringing what we most take for granted into our awareness: life. It offers us a very real opportunity to show gratitude for our life every moment of every day. I used to get frustrated at not being able to focus for long on my breath. It really is one of the hardest things the conscious mind can do. It is so easy to focus on the “failure” of the mind every time it wanders. The mind is just doing what it normally does—work. Through acceptance of that fact, every “failure” can instead be seen as an opportunity to expand the consciousness of our thought process and show gratitude for the fact that we are even aware of our thoughts. By training consciousness on the complex process of breathing, even if not much “progress” is made in following the breath, the simpler processes of being mindful of one’s thoughts and speech do realize benefit. It’s said that to improve in a sport you have to play someone better than you. Meditating on the breath, in all its difficulty, offers a unique opportunity: we’re always winners just for trying. 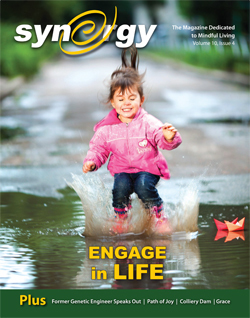 Kiva Bottero publishes a journal of engaged living, The Mindful Word. This entry was posted on Sunday, July 26th, 2009 at 10:43 am	and is filed under MINDFUL LIVING. You can follow any responses to this entry through the RSS 2.0 feed. You can leave a response, or trackback from your own site.